Everything that’s old is new again. That’s how the tech game is played. Products evolve and leave vacuums for new startups to rush in and fill. 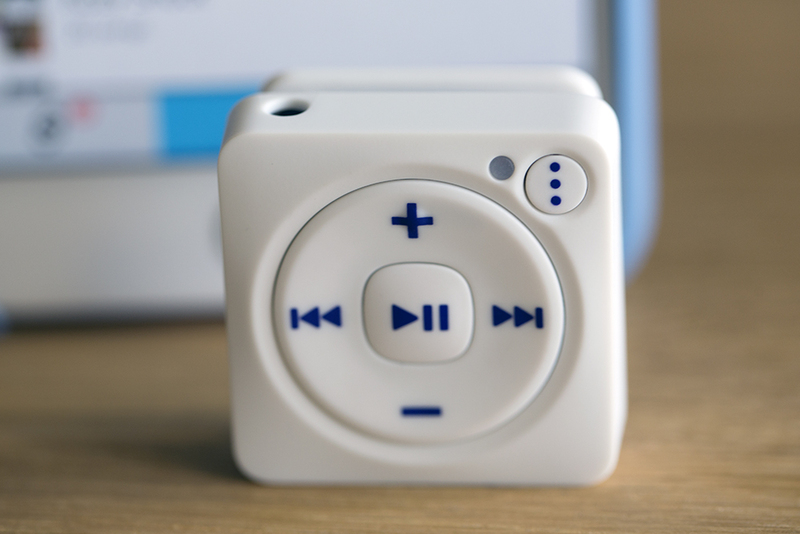 For Mighty, the long, slow death of the MP3 player presented just such an opening. The company launched a Kickstarter last year with the promise of “streaming music without your phone,” delivering the still-tangible benefits of devoted music hardware for the Spotify generation. The startup built up enough excitement to hit $300k on the crowdfunding site, and the recent end of the iPod shuffle and nano have only furthered that interest among consumers. CEO Anthony Mendelson tells us that company has embraced the media’s christening of the devices as an “iPod shuffle for Spotify .” While much of the underlying technology is different, the principle is basically the same: a screenless, clip-on player for taking music on the go. It’s a small niche in the overall music listening market, and clearly Apple didn’t see enough value in continuing to produce the things. But there are certain scenarios that aren’t served by phones alone. Fitness is probably the largest — going for a run with a smartphone is a pain. There’s also an opening for users with an underground commute and people who frequently have to switch into airplane mode. 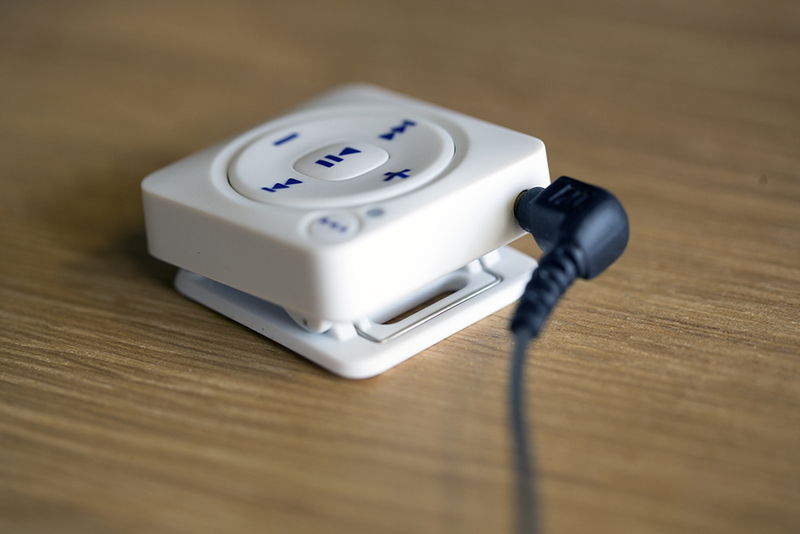 Parents have expressed interest in the device so they don’t have to hand kids their phone to listen to music and people have also picked a Mighty up for elderly parents. Price was alway the other key to the shuffle’s success, and Mighty has taken great pains to keep its first player under $100. That’s easier said than done for a relatively small run from a brand new company, but the device (known as the M1, internally) is priced at $86 — pricier than the last Shuffle, but at a considerably higher (8GB) capacity. Hitting that price point required some comprises on the company’s part, and there are still a fair number of wrinkles to iron out here, but the first Mighty will tick most of the important boxes for users. The Mighty’s not a bad looking player. It’s a bit boxy and fairly reminiscent of the shuffle — the form factor, after all is fairly limiting. The startup’s industrial design lead came over from Samsung and took the necessary precautions to avoid coming too close to Apple’s design language here. The result is a similar circular button array, with play/pause at the center. The circle sports volume and track advance options, though, oddly, there’s no fast forward or rewind yet. It’s a pretty big blindspot for a music player, but apparently the Spotify API that allows for it creates a pretty big lag. Mendelson tells me the company is working on a fix, but didn’t offer a timeframe. Above all that is a button designed specifically cycling through playlists, the primary method for inputting music from Spotify, at present. Playlists certainly make sense as a method for grouping together music on a playing without a screen. Otherwise it’s all a big crapshoot. There’s also a robot voice that lets you know the name of each playlist before it begins. The player is made from a plastic composite. It feels a bit cheap — one of those aforementioned cost cutting measures. Mendelson tells me the company is looking into building an aluminum model for the next go-round, but the current model is still reasonably rugged. It can withstand a quick dip water and will likely survive a couple of falls onto the harsh concrete below. There’s also a big clip on the back, a la the shuffle, and headphone jack up top. The device will connect to Bluetooth headphones, but excluding a hardwired option doesn’t make a lot of sense on a device that counts cost among its main selling points. Apparently Spotify was so impressed with Mighty’s Kickstarter that it decided to work closely with the startup. For Spotify, it mean a piece of hardware devoted exclusively to its service, without having to invest in any R&D. For Mighty, it means a figurative seal of approval, along with a literal one on the product’s packaging. As far as actual integration goes, the setup requires tying a bunch of accounts together. 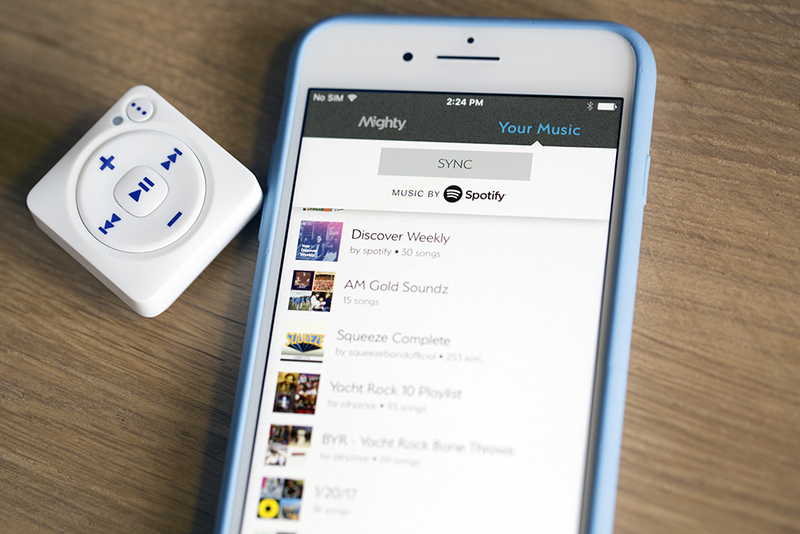 Mighty has its own app that needs to be associated both with the Spotify app. Users can also tie it directly to Facebook for quicker account set up. Direct integration with Spotify would be nice, but the streaming service isn’t really set up for that. Instead, users drag and drop content through the Mighty app. That means there’s a lot of switching back and forth — you make the playlists on Spotify and import them through Mighty. It feels like a bit of a workaround, but unless Spotify ends up embracing this sort of technology more fully, it’s a necessary one. At very least, it gets the job done. Mighty’s full embrace of the Spotify SDK means offline streaming works exactly the way the service wants. The built-in WiFi means the device connects to Spotify’s server at regular intervals, ensuring that the account associated with the device is still active (up to three offline devices can be associate to one account). If it goes 30 days without checking in, the system tacks a vocal watermark to the music, telling you to sync it, and assumedly ruining the listening experience in the process. It’s odd phrasing for a device that’s essentially a streaming update to a bygone product, but Mighty clearly wasn’t the only company circling the idea. Pebble was flirting with the idea with Core before the company imploded and was subsequently swallowed up by Fitbit. If the LTE-enabled Apple Watch rumors prove true, that could potentially cut into a significant piece of Mighty’s niche, by playing to runners looking for musical accompaniment beyond the phone. Mighty is clearly already looking beyond this initial release. Mendelson has already previewed a number of things the company is working on to both improve this first generation and offer up in the inevitable M2 device. The addition GPS and an accelerometer for fitness functionality, including syncing music to running speed. You can probably expect that model to arrive roughly a year from now, at a higher price point than the current version. More than likely it will exist alongside its predecessor as Mighty continues to work to improve functionality on that unit. It remains to be seen how large the market really is for these devices, but as it stands, the Mighty does a pretty admirable job filling in the gap left by the iPod shuffle and its ilk.